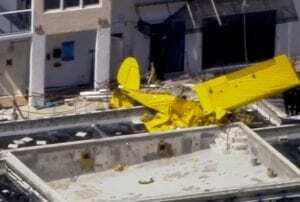 A small light aircraft crashed into an 18-story home in Fort Lauderdale, Florida. As a result of the accident, the pilot died. The incident occurred around 11:55 local time.The plane with an advertising banner crashed into a house between the 16th and 18th floors and fell near the pool. The residential building was under repair for over a year, so there were no injuries, except for the pilot. Resident of one of the apartments where the plane crashed, was lucky. He was just at home when the ship hit the building. After the impact, a part of the engine broke through the wall and knocked out a dishwasher and a man flew into the kitchen. Luckily there was no one in the room. It is known that the plane took off from North Perry Airport to Pembroke Pines (in southeast Florida). Before the incident, he was seen above the beach. The causes of the accident are being investigated. One of the versions is that the banner was stuck between the wings and the tail of the aircraft, which may have caused the loss of control and, as a result, the ship’s accident. Next PostNext These New Rules Make It Much More Difficult To Become A Legal Immigrant In The U.S. Which state has passed the most restrictive abortion ban in the US?